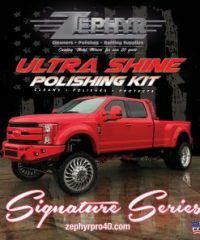 THIS KIT IS INTENDED FOR ALUMINUM WHEELS THAT ARE NOT OXIDIZED OR PITTED. THE KIT IS FOR MAINTENANCE, AND NOT FOR THE REMOVAL OF OXIDATION. 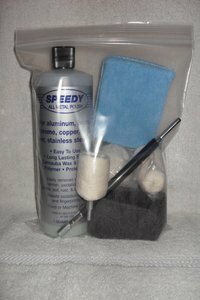 THE BASIC KIT CONTAINS THE FOLLOWING: THREE 3 1/2″ WOOL/SYNTHETIC POLISHING PADS FOR POLISHING, AN 8 OZ. JAR OF BRIGHT WORK METAL POLISH (FINISHING), A BACKING PLATE WITH 1/4″ SPINDLE (USE WITH A 1/4″, 3/8″ OR 1/2″ DRILL), ONE 3″ INCH MUSHROOM BUFF FOR AROUND LUG NUT AREA, ONE SMALL CYLINDER BUFF FOR SLOTS, ONE 8″ EXTENDER, AND TWO 16″ X 16″ MICROFIBER TOWELS. 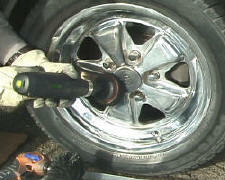 DO NOT USE ON CLEARCOATED WHEELS. THE BRIGHT WORK METAL POLISHES EMPLOYED IN THIS KIT ARE USED INTHE AIRCRAFT INDUSTRY, BRIGHT WORK POLISHES WORK VERY WELL WITH THESE KITS. DO NOT OVERAPPLY. A LITTLE GOES A LONG WAY. THE 8″ EXTENDER CAN BE USED TO REACH RECESSED AREAS IF NEEDED. SIMPLY UNSCREW THE SHANK FROM THE GOBLET, AND THREAD THE EXTENDER ON THE SHAFT. “HOW TO USE” FLYER IS INCLUDED.